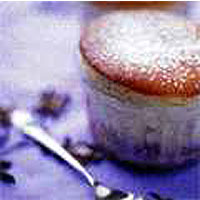 Instead of using a single soufflé dish, you can use eight small ramekins. In this case, cook them for 10 minutes only. Preheat the oven to 200°C/gas mark 6. Liberally butter a 1.4 litre soufflé dish, dust with granulated sugar and shake out the excess. Stand the dish (or ramekins) in a deep roasting tin. Whisk together the egg yolks and caster sugar in a bowl. Beat in the sifted flour. Heat the milk to just below boiling point, then slowly pour in a thin stream into the egg yolks, beating vigorously as you do so. Return the mixture to the saucepan and set over a medium-low heat, stirring constantly. Make sure that it does not come to the boil or it will curdle. Gradually it will turn into a thick custard. As soon as it does, remove from the heat and beat in the butter, lemon zest and lemon juice. Pour into a large bowl and stir occasionally until cool. Whisk the egg whites in a clean dry bowl with a pinch of salt until they form soft peaks. Using a metal spoon, lightly fold into the lemon custard. Spoon half the mixture into the soufflé dish or ramekins. Sprinkle with the sugared raspberries, then cover with the remaining mixture. Pour enough boiling water into the roasting tin to come 2cm up the side of the soufflé dish. Place in the centre of the oven and reduce the heat to 170°C/ gas mark 3. Bake for 40-45 minutes or until set but slightly wobbly. Serve immediately.